GPS receivers make great gifts! Not too many outdoor recreationists can turn down a high-tech gadget gift for Christmas. And there is nothing more high tech than a Global Positioning System unit. "They are amazing technology at an amazingly affordable price," said Bob Speik, an Alpine mountaineering instructor and Web site author. "They've gone from a clunky, expensive toy that often left you wandering in the trees to units half the size of a pack of cigarettes." Besides being compact, GPS units also can be used for a variety of activities. "They're an in-demand product," said Gil Muhleman, sales manager at G.I. Joe's Inc. in Bend. "They can be used for so many different outdoor activities: snowmobiling, ATVs, hiking, boating." They are also useful for hunters, anglers, and backcountry skiers, to list a few outdoor recreationists who might find a GPS unit helpful when deep in the backcountry, where getting lost can be not only be inconvenient, but life threatening. GPS units have the ability to put out a series of coordinates that can tell the user exactly where on the map he or she is located. Some units even come with their own maps that can be called up on the GPS's screen, and specific maps can be downloaded into some GPS units. Perhaps most importantly, a GPS unit can direct its owner of it back to the starting point. "The huge value of the GPS is to be able to bring you back to your car," said Speik. Prices for GPS units start at about $100 and go, up from there. They are inconsequential-looking devices, considering the magnitude of the tasks they are asked to perform. But the little device that can be held in the palm' of the hand has several dozen orbiting satellites backing it up. Some history: The original purpose of these satellites was for United States military use. In the 1990s, the satellites were made available to ordinary citizens but had "selective availability," which essentially reduced a GPS unit's accuracy with the idea of preventing someone from using the system with evil intent. Then, on May 1, 2000, that misdirection was eliminated and now GPS users can count on accuracy to within a few meters. All those developments, and the increasing affordability of GPS units, have led to an increased popularity and interest in GPS navigation that has taken the devices from being ancillary to a chosen sport to a sport all in itself. It's called geocaching. In geocaching, GPS users attempt to locate a cache placed by another GPS user. These caches are located in every state, and dozens of them are in Central Oregon. To participate, go to www.geocaching.com, jot down the coordinates of a cache listed on the site, then break out the GPS and have at it. 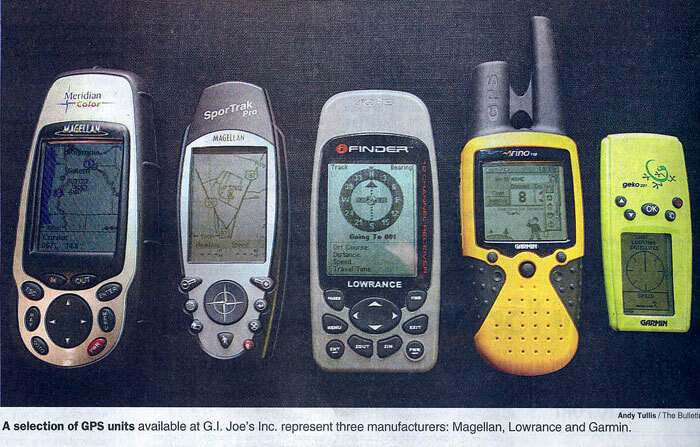 'Some of the main manufacturers of GPS units are Garmin; Magellan, and Lowrance. Each has a variety of GPS units that range from about $100 to more than $300. But one thing to keep in mind when shopping for a GPS: Higher price does not equal greater accuracy. "All these instruments have the same basic accuracy, which can be anywhere from dead on to a few yards off," said Speik. "I would say that the least expensive have the same degree of accuracy as the most expensive." Recently, some GPS units have been equipped with WAAS (Wide Area Augmentation System), which uses additional satellites and ground stations to provide GPS signal corrections. But these GPS units cost more and, Speik said, are not a worthwhile addition in the Northwest because the system does not yet provide a big benefit in the region. That means many local GPS users simply turn the WAAS capability off when they head afield, Speik said. GPS units go through batteries quickly. Another add-on of limited value, Speik noted, is an altimeter. Since the GPS unit itself is capable of determining altitude using satellites, he argues, there is really no need for an additional instrument to do the same thing based on barometric pressure. Speik and Muhleman differ on the need for a digital compass. "I think the compass is the key," said Muhleman. He noted that's what he's found would most often solve the problem when people return a GPS unit out of frustration after not being able to figure out how it works. "The GPS has no idea in which direction the unit is pointed unless you are going at a walking pace. The digital compass does it all for you. It's real simple and it's more error free." Speik, on the other hand, believes a digital compass merely masks a user's lack of understanding of how a GPS works. Understanding the equipment first, and also bringing along a traditional compass plus a good map, he contends, will always be superior to a digital compass. "People can't use a GPS because they think it's going to do everything for them, but they don't know what it is they want it to do," Speik said. Besides that, the only GPS that comes with a digital compass is made by Magellan and costs more than $300. But it's not the most expensive. What seems to drive the price is a GPS unit's ability to download maps. The more it is capable of downloading, the more expensive it is. Speik has several GPS units which can download maps. It can be a fun addition, but the problem he has found is that so little information can be displayed on the GPS unit's screen that the maps are of little value. "The map inside the GPS in no way substitutes for (fold-out) maps," Speik said. "You can't have that much detail inside the tiny memory of a GPS.... I would sure recommend that people get (fold-out) maps." "I would recommend either one," said Speik. "Either the basic yellow eTrex or the SporTrak. You should be able to find either one at around $100." Units that cost four and five times that amount are out there with all kinds of bells and whistles. "Do not get the more expensive one unless they really get into it because it will be much more difficult to operate," Speik said. GPS units also eat batteries; a day afield will usually burn up at least a couple, if not more. "You just buy 10 batteries at a time and it's part of doing business," Speik said. `Batteries will last for a full day of geocaching. That's a lot of fun for a couple dollars." GPS units also have a limited internal power supply that makes sure stored data isn't lost when the batteries are being changed. Finally, as with many high tech gadgets, there's a learning curve. Speik offers a course called Map, Compass and GPS, which is limited to two to five people and costs $30 per person. He can be contacted at 385-0445. He also offers advice on his Website: www.TraditionalMountaineering.org. Wanna play? Maps show you the way!